UPSC Civil Services Exam 2014 – Apply Online for 1291 Vacancies: Union Public Service Commission (UPSC) has given employment notification for the recruitment of 1291 posts in various services by conducting Civil Services Preliminary Examination 2014. Eligible candidates may apply online from 31-05-2014 to 30-06-2014 till 11.59 PM. Other details like age limit, educational qualification, selection process, how to apply are given below. 8. Indian Revenue Service (I.T), Group ‘A’. 23. Pondicherry Civil Service, Group ‘B’. Age Limit: Candidates age should be above 21 years and below 32 years as on 01-08-2014 i.e., he/ she must have been born not earlier than 02-08-1982 and not later than 01-08-1993. The upper age relaxation is 05 years for SC/ ST, 03 years for OBC and 10 years for PH candidates. Age relaxation is applicable as per rules. Educational Qualification: Candidates must possess Degree or equivalent qualification of any of Universities incorporated by an Act of the Central or State Legislature in India or other educational institutions established by an Act of Parliament or declared to be deemed as a University. Application Fee: Candidates need to Pay Rs.100/- either by online or offline mode. No Fee for Female/ SC/ ST/ PH candidates. Online Mode: Candidates can pay the prescribed fee through online mode by using net banking facility of State Bank of India/ State Bank of Bikaner & Jaipur/ Sate Bank of Hyderabad/ State Bank of Mysore/ State Bank of Patiala/ State Bank of Travancore or by using Visa/ Master Credit/ Debit Card up to 30-06-2014 at 23.59 hrs. Offline Mode: Candidates can pay the prescribed fee through ‘Pay by Cash’ mode, take print out of system generated Pay in slip during part II registration and deposit the fee at the counter of SBI Branch on the next working day only up to 29-06-2014 at 23.50 hrs. Selection Process: The Civil Services Examination will consist of two successive stages. Civil Services Preliminary Examination (Objective type) for the selection of candidates for the Main Examination and Civil Services Main Examination (Written and Interview). How to Apply: Eligible candidates may apply online through the UPSC website http://www.upsconline.nic.in from 31-05-2014 to 30-06-2014 till 11.59 PM. Retain printed copy of application form for future use. 1. Candidates should scan their photograph and signature for uploading. 2. Log on to www.upsconline.nic.in. 3. Click on ‘Online Application for Various Examinations of UPSC’. 4. Click on Part I Registration link which consists of personal details. 5. After filling up all marked details of Part I, click on ‘Continue’ button. 6. This will provide you with Registration ID, retain it. 7. Enter the payment details in the appropriate place & Pay the Fee (if applicable). 8. If the candidate has opted for the fee remission in the PART-I Registration these payment option and pages will not be shown to him and he will be directed to the photograph & signature specimen uploading page. 9. To fill up Part II of Application, Registration Number and Date of Birth must be entered. 10. Fill all marked details in the application form, upload photo & signature. 11. After submission of all the details click on ‘Submit’ button and take the print of the hard copy of application form and retain it for future use. Starting Date for Submission of Online Applications: 31-05-2014. Last Date for Submission of Online Applications: 30-06-2014 till 11.59 PM. Last Date for Payment of Fee through ‘Pay by Cash’: 29-06-2014 at 23.59 hrs. Last Date for Payment of Fee through Online mode: 30-06-2014 at 23.59 hrs. Date of Preliminary Examination: 24-08-2014. Date of Main Examination: December 2014. UPSC Indian Forest Service Exam 2014 – Apply Online for 85 Vacancies: Union Public Service Commission (UPSC) will hold a Screening Test for selection to Indian Forest Service (Main) Examination, 2014 through Civil Services (Preliminary) Examination, 2014. Approximately 85 vacancies are there. Eligible candidates may apply online from 31-05-2014 to 30-06-2014 by 11:59 PM. For more details like age limit, qualification, selection process, application fee, how to apply are given below. Age Limit: Candidates age limit should be 21 years and must not have attained the age of 32 years as on 01-08-2014, i.e must have been born not earlier than 02-08-1982 & not earlier than 01-08-1993. Age relaxation will be applicable as per rules. Educational Qualification: Candidates must hold a Bachelors Degree with atleast one of the subjects namely Animal Husbandry & Veterinary Science, Botany, Chemistry, Geology, Mathematics, Physics, Statistics & Zoology or a Bachelor’s degree in Agriculture, Forestry or in Engineering of any of Universities incorporated by an Act of the Central or State Legislature in India or other educational institutions established by an Act of Parliament or declared to be deemed as a University Under Section 3 of the University Grants Commission Act, 1956, or possess an equivalent qualification. Selection Process: The competitive examination consists of two stages, Civil Services (Preliminary) Examination (Objective Type) for the screening & selection of candidates for Indian Forest Service (Main) Examination & Civil Services (Preliminary) Examination (Objective Type) for the screening & selection of candidates for Indian Forest Service (Main) Examination (Written Examination & Interview). Application Fee: Candidates applying (excepting Female/ SC/ ST/ PH candidates who are exempted from payment of fee) for Civil Services (Preliminary) Examination are required to pay a fee of Rs.100/- either by depositing the money in any Branch of SBI by cash, or by using net banking facility of SBI, State Bank of Bikaner & Jaipur/ State Bank of Hyderabad/ State Bank of Mysore/ StateBank of Patiala/ State Bank of Travancore or by using Visa/ Master Credit/ Debit card. How to Apply: Candidates may apply online through website www.upsconline.nic.in for Civil Services (Preliminary) Examination which will act as a screening mechanism for selection of candidates for the Indian Forest Service (Main) Examination from 31-05-2014 to 30-06-2014 by 11:59 PM. 1. Before Applying Online Candidates are required to scan their photo and signature. 3. Select on ‘Online Application for Various Examinations of UPSC’ link and select the Civil Services (Preliminary) Examination. 4. Select the Part-I Registration link which consists of personal details. 5. After filling up all marked details of Part-I, click on ‘Continue’ button. 6. A fresh page opens up fill all the details & again click on the “Cotinu” Button. 7. A fresh page opens up indicating your Registration Id and showing three options of payments. 8. Your Application will be submitted successfully, take the printout copy of application. 9. Part-I registration will be completed & Now Click on the “Part-II Registration”. 10. Part-II registration consists of Two parts – filling up uploading Photograph & Signature, Payment details of Examination Fee (where applicable) and Examination Center. 11. Login by providing Registration ID, DOB details. 12. The candidates are required to pay a fee of Rs.100/- either by depositing the money in any branch of SBI by cash, or by using net banking facility of State Bank of India/State Bank of Bikaner & Jaipur/ State Bank of Hyderabad/ State Bank of Mysore/ State Bank of Patiala/ State Bank of Travancore or by using any Visa/ Master Credit/ Debit Card. 13. Upload the Photograph & signature, click on the continue button. 14. If the candidate has opted for the fee remission in the PART-I Registration these payment option and pages will not be shown to him and he will be directed to the photograph & signature specimen uploading page. 15. After submission of all the details click on ‘Submit’ button and take the print of the hard copy of application form and retain it. 16. This will provide you with Registration ID, retain it. Starting Date to Apply Online: 31-05-2014. Last Date to Apply Online: 30-06-2014 by 11:59 PM. Pay in Slip mode will be Deactivated on: 29-06-2014 by 23:59 Hrs. Date of Main Examination will be held on: November, 2014. B.Tech in Electrical and Electronics Engineering have plenty of opportunities in both government and private organizations. Government organizations and PSUs usually release notification about vacancies in national dailies. Indian Engineering Service: The UPSC Board for recruitment conducts the Indian Engineering Service (IES) examination for recruiting engineers into various government departments. The recruitment process involves two step- written examination and personality test. The written examination carries 1000 marks and comprises five papers. Paper -I is the general ability test, which assesses the candidate’s competence in English and General Studies. It carries 200 marks. Paper II and III carry questions from the relevant engineering subject and carry 200 marks each. Papers I, II and III are objective type. Papers- IV and V are conventional type and carry 200 marks each. They deal with the relevant discipline of engineering. Research Organizations: Research organizations like the Indian Space Research Organization, Defence Research and Development Organization and Vikram Sarabhai Space Centre hire engineering graduates for various job roles. The minimum eligibility criterion for most of them is at least 65 per cent marks in BE/ B.Tech. Candidates are short-listed for written test and interview, based on their academic record and GATE score. Electricity Boards: Electricity boards of various States hire engineers for posts like Assistant Engineer. Selection is based on performance at entrance test. Along with these, organizations like Indian Oil Corporation Ltd and Bharat Electronics Ltd hire engineers. Coming to jobs in private organizations, you can explore opportunities in industries like electrical, electronics, communications, telecommunications, information technology and instrumentation. An electrical engineering graduate can begin his/her job search by contacting placement department in their respective colleges. Seek their advice on building a resume and handling job interviews. Post you resume on job portals. Consult a few recruitment firms and ask them if they can help you find a job. Use social networking sites like this blog to build your contacts and spread word that you are looking for a job. Request them to refer you whenever there is a suitable opportunity in their organization. Work towards improving your technical and communication skills. Keep yourself updated with the latest developments in your field. For this, you can read relevant material in industry specific magazines and on the Internet. Prolific Systems and Technologies, Hyderabad offers Certified Programmable Logic Controllers Training. This training program covers PLC and SCADA. It provides practical experience of working on leading brands of PLCs such as Allen Bradley, Siemens, Modicon and GE Fanuc. It covers popular SCADA software such as Wonderware InTouch. The institute offers placement assistance also. Advanced Training Institute for Electronics and Process Instrumentation (http://atiepihyderabad.gov.in) at Ramanthapur, Hyderabad offers training in PLC and SCADA. Thanks for Your Interest in our Website. Please Share this info to your Friends.! National Aluminium Company Limited (NALCO), Bhubaneswar has posted a notification for the recruitment of 140 Graduate Engineer Trainee vacancies through GATE 2014. Eligible candidates may apply online from 25-05-2014 by 09.00 AM to 30-06-2014 by 06.00 PM. Other details like age limit, educational qualification, selection process, how to apply are given below. Age Limit: Candidates upper age limit is 30 years as on 30-06-2014 i.e candidates born before 30-06-1984 need not apply. The upper age relaxation is 05 years for SC/ ST, 03 years for OBC, 10 years for PWD-UR, 13 years for PWD-OBC and 15 years for PWD-SC/ ST candidates. Educational Qualification: Candidates must possess Full time regular Bachelor’s Degree in Engineering or Technology or Master’s Degree in Computer Application for Computer Science discipline candidates with not less than 65% marks for UR & OBC and 55% marks for SC/ ST/ PWD category candidates and have valid GATE 2014 Score. Selection Process: Candidates will be selected based on performance in Personal Interview. How to Apply: Eligible candidates may apply online through the NALCO website www.nalcoindia.com from 25-05-2014 by 09.00 AM to 30-06-2014 by 06.00 PM. Take print out of application form for future reference. 1. Candidates must scan their GATE 2014 Admit Card, Photograph, Signature & prescribed qualification mark sheets for uploading and have valid e-mail id. 2. Log on to the website www.nalcoindia.com. 3. Click on Careers —> Online Registration for recruitment of GETs through GATE 2014. 4. Click on Click here to apply online. 5. Fill all the mandatory details and Submit. 6. A User Id & Password will be generated, remember it for future use. 7. Take print out of application form for future reference. Starting Date for Submission of Online Applications: 25-05-2014 by 09.00 AM. Last Date for Submission of Online Applications: 30-06-2014 by 06.00 PM. 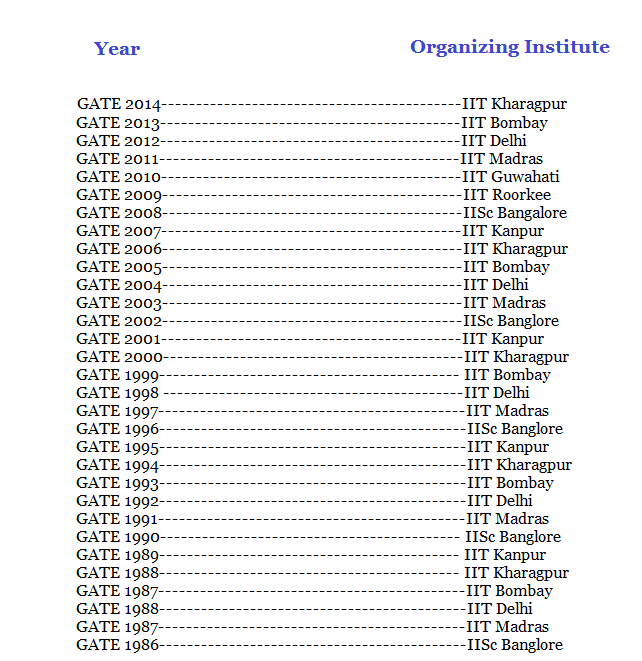 Here's the collection of all the Question papers and Answer keys of GATE 2014 held by IIT Kharagpur. We hope, it helps you in your preparation for Competitive exams. Thanks for your Interest. Modern Control Theory by U.A Bakshi & A.V.Bakshi from Technical Publications is very useful for the JNTU Students for Control Systems & Modern Control Theory subjects. It is preferable for University exams only. Here's a Hand written notes of Digital Electronics useful for Competitive exams such as GATE, SAIL, BARC, ISRO, SSC JE, GENCO, TransCo, SPDCL, CPDCL etc,. This notes helps you a lot if read with a basic fundamental knowledge. All The Best..
State Bank of India (SBI) has released notification for recruitment of 5199 Assistants in Clerical Cadre in State Bank of India. Eligible candidates can apply online from 26-05-2014 to 14-06-2014. Other details like age limit, educational qualification, selection process and how to apply are given below. Age Limit: Candidate minimum age is 20 years and maximum age limit should not exceed 28 years as on 01-05-2014. Candidates born between 02-05-1986 and 01-05-1994 (both days inclusive) are only eligible to apply. Age relaxation will be applicable as per the rules. Educational Qualification: Candidate should possess a Degree (Graduation level) from a recognised university, or any equivalent qualification recognised as such by the Central/ State Government. Those who are in the final year of Graduation/Semester may also apply provisionally subject to the condition that, if called for interview, they will have to produce proof of having passed the Graduation Examination on or before 31-08-2014. Selection Process: Candidates would be selected based on their performance in online test and interview. Application Fee: Candidates have to pay the application fee and intimation charge of Rs.100/- for SC/ST/PWD/XS and Rs.450/- for General and OBC category through online or offline mode. The fee sent through Indian Postal Order, Bank Drafts, Cheques, Currency Notes etc. will not be accepted. Offline Payment: After completion of online registration process take printout of the system generated fee payment challan immediately and pay the fee from 2nd working day after registration and can be made within three working days (subject to last date for fee payment) at any branch of State Bank of India. Online Payment: Candidates can pay fees through the payment gateway integrated with the application, following the instructions available on the screen. The payment can be made by using Master/ Visa debit/ credit cards or Internet Banking by providing information as asked on the screen. Transaction charges for online payment will be borne by the candidates. On successful completion of the transaction, e-receipt and application form will be generated. How to Apply: Eligible and interested candidates can apply online through the Bank’s website www.statebankofindia.com or www.sbi.co.in from 26-05-2014 to 14-06-2014. After registration candidates have to pay fee through either online (using Debit/ Credit card / Internet banking) or off line mode. After submission of online application, take printout of the submitted application form and keep it for future reference. 1. Before applying online candidate should have valid email ID and scanned copy of photograph and signature. 2. Log on to Bank’s website www.statebankofindia.com or www.sbi.co.in. 3. Click on Recruitment link–> Click on Appropriate link—> Click ‘Apply Online’. 4. Fill the application form carefully and upload the scanned copy of signature & photograph and submit the error free application form. 6. Take printout of the system generated fee payment challan immediately and pay the fee as mentioned above. 7. On payment of fee, registration of online application will be complete. 8. Take printout of the submitted application containing fee details, after three days of fee payment and keep it for future reference. BEL has released notification for Probationary Officer vacancies in the Following Disciplines. Here's a Hand written notes of Synchronous Machines & DC Machines useful for Competitive exams such as GATE, SAIL, BARC, ISRO, SSC JE, GENCO, TransCo, SPDCL, CPDCL etc,. This notes helps you a lot if read with a basic fundamental knowledge. All The Best.. Here's a Hand written notes of Power Electronics for Competitive exams such as GATE, SAIL, BARC, ISRO, SSC JE etc,. This notes helps you a lot if read with a basic fundamental knowledge. All The Best.. Here's a Hand written notes of Transformers & Induction Machines useful for Competitive exams such as GATE, SAIL, BARC, ISRO, SSC JE, GENCO, TransCo, SPDCL, CPDCL etc,. This notes helps you a lot if read with a basic fundamental knowledge. All The Best..
Osmania University has started issuing Hall Tickets for AP PGECET 2014. You can download the the same by following the link below or Provide the following details in the comment box to get it to your mail ID directly. According to the previous year GATE Exams and conducting Institutes pattern, IIT Kanpur may be the Institute going to conduct GATE 2015. After finishing the preparation once, better go through the GATE 1989, 1995, 2001 and 2007 Question papers 2 to 3 times so that You'll have a basic idea about the paper setting and motive of the questions. You'll also be confident than earlier. ALL THE BEST.. Here's a Hand written notes of Network Theory useful for Competitive exams such as GATE, SAIL, BARC, ISRO, SSC JE etc,. This notes helps you a lot if read with a basic fundamental knowledge. All The Best.. Here's a Hand written notes of Control Systems useful for Competitive exams such as GATE, SAIL, BARC, ISRO, SSC JE etc,. This notes helps you a lot if read with a basic fundamental knowledge. All The Best.. Here's a Hand written notes of Electrical and Electronic Measurements useful for Competitive exams such as GATE, SAIL, BARC, ISRO, SSC JE etc,. This notes helps you a lot if read with a basic fundamental knowledge. All The Best..